I am trying to define and illustrate the various traditional forms of the Finnish puukko and Saku Honkilahti was kind enough to offer some background and information on the Kokemäen. Saku is a puukkoseppa and I’m happy to say I own one of his puukkos with a beautiful stacked birch handle. To see his work please visit his website at: http://www.netikka.net/sakunsivu/ Thank you for all your help Saku! “The fact of who actually developed or invented the Kokemäenjoki puukko or even when, is unknown. 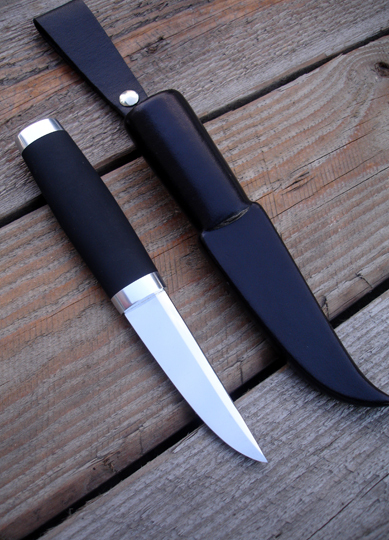 A Kokemäenjoki knife is very simple, functional and straightforward, devoid of decoration. It has always been primarily a tool, not a weapon. The Kokemäen puukko is typically timber handled, usually curly or flame birch, which has a clear reason. The handle has no ferrules, so the wood itself must be strong and tough. Normal size in a knife handle, a length of all Finnish puukko is typically 100 + mm, the width of a man’s hand. Cross-section is oval and the blade tapers both both forward and backward. Height of the handle is at most 30 mm and a thickness of 20 mm. 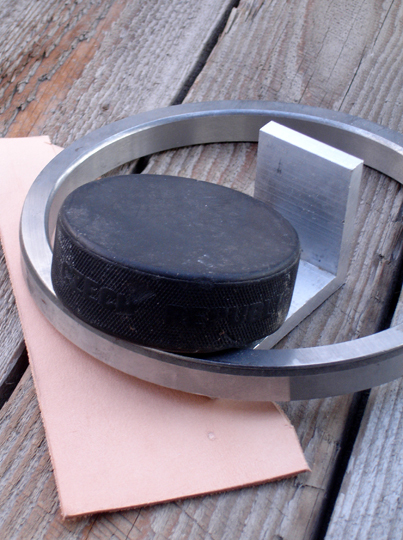 The second feature is that the blade tang does not go through, it is called a stick tang. Because the handle must sit very tightly, it is traditionally inserted into the handle by burning, thus it is not drilled. The third feature is the “gap” between the blade and the handle. One explanation could be that the seam is possible to keep clean. 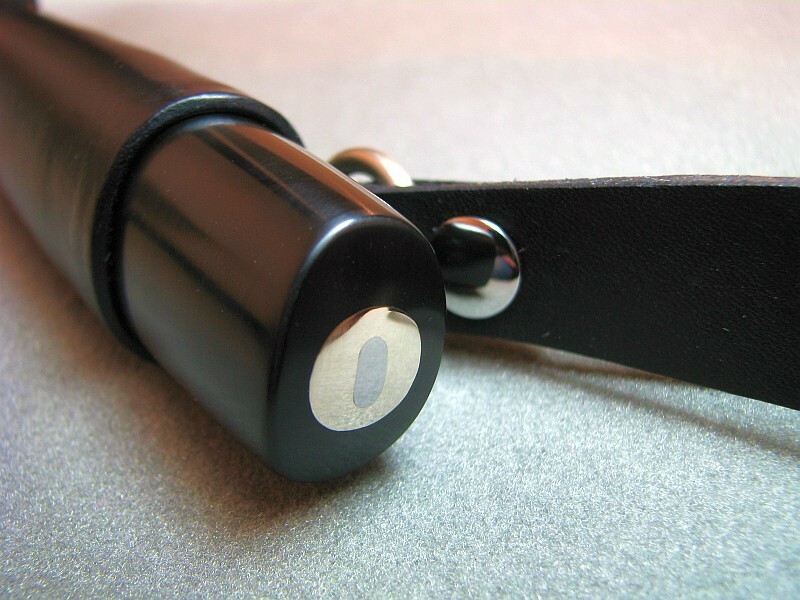 Another explanation of the design is that it allows one to tighten the blade later. The third is that the final grinding is easier. The truth is that no one knows anymore. The top of the blade is oval-shaped cut. Handles have mainly the oil finishing. 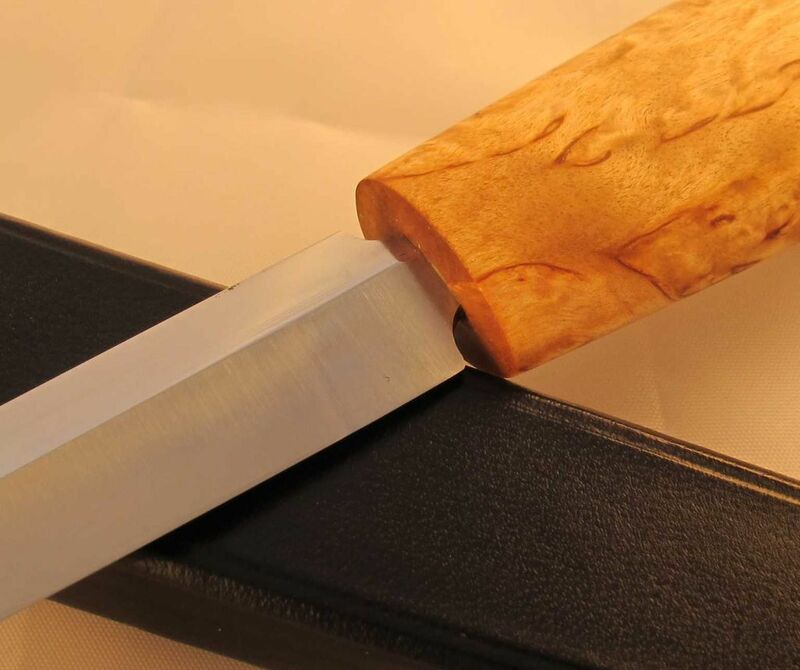 The blade is the typical Finnish form of a puukko blade: upright, without a gig in the tip, sharpened straight and and typically a little longer than the 100 to 130 mm handle, and also lower around 15 to 20 mm high. In hand the Kokemäen puukko must feel natural and lively, not clumsy at all. 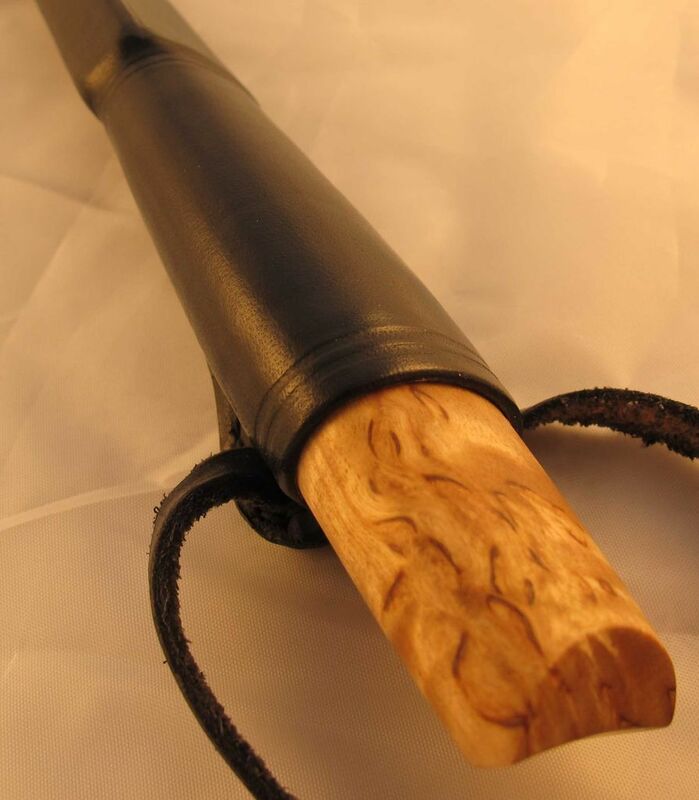 The Kokemäen sheath is the most spectacular part. 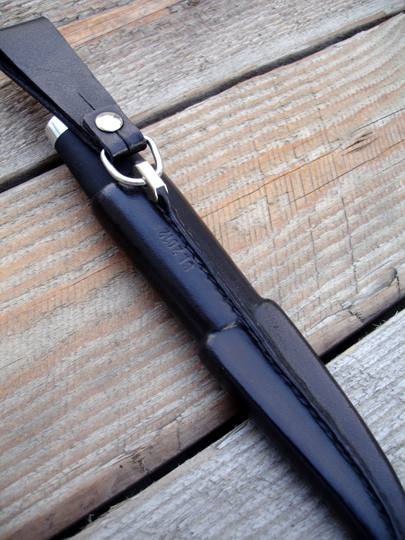 In general, it is brown leather and designed with a slightly pointed gig. 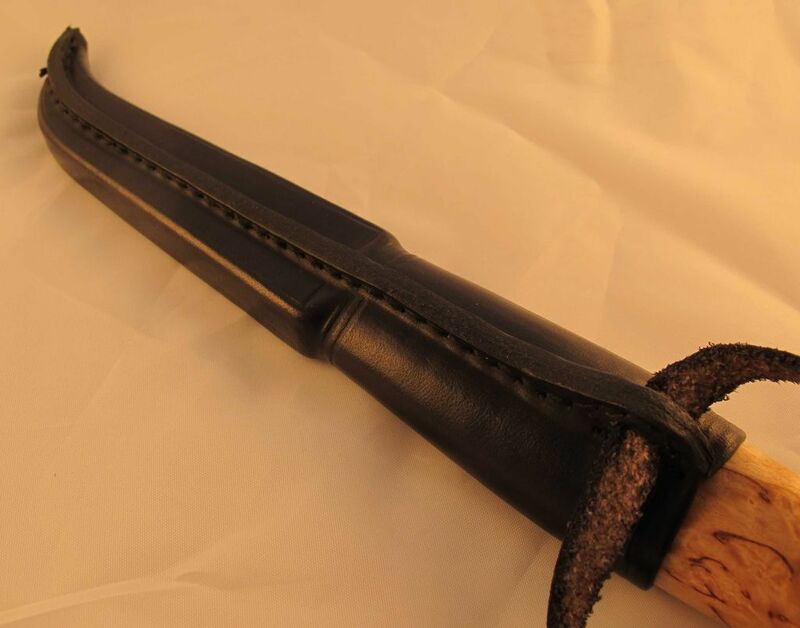 The upper part of the sheath is long, knives must sit firmly in the sheath. The hanging loop is a simple leather loop or sometimes metal chain. Akseli Ekman (02.25.1883 – 06.20.1950) was the only professional knife maker who made the Kokemäen puukkos for a living. He was also a shoe maker and well known from his first class quality sheaths. The blades he made mostly from old files. Near his workshop also lived a blacksmith, Peltonen who made the blades for him until they came to a dispute in 1942, when Ekman won a famous knife competition but did not mention his blade smith at all. Ekman’s production was at its peak since the 1920s and even 1940-50, when his puukkos were sold from the local hardware stores etc. They had a very good reputation. Ilmari Kuula (09.28.1903 – 10.23.1983) made a career as a gurad at the Cedercreutz Art Museum, a job he held for 45 years, vv. 1933 – 1978. 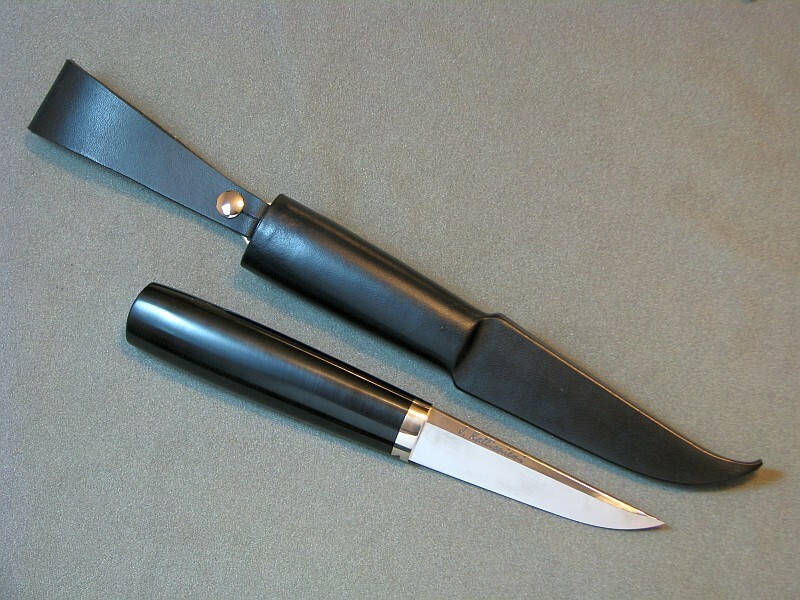 Also his brother Aarne Kuula (11.18.1911 – 08.19.1985) made Kokemäen puukkos, mainly by commission and hobby and neither of them made a living making knives. Keikki Marjanen (10.21.1918 – 01.31.1989) made smaller Kokemäenjoki puukkos, several hundreds of knives. 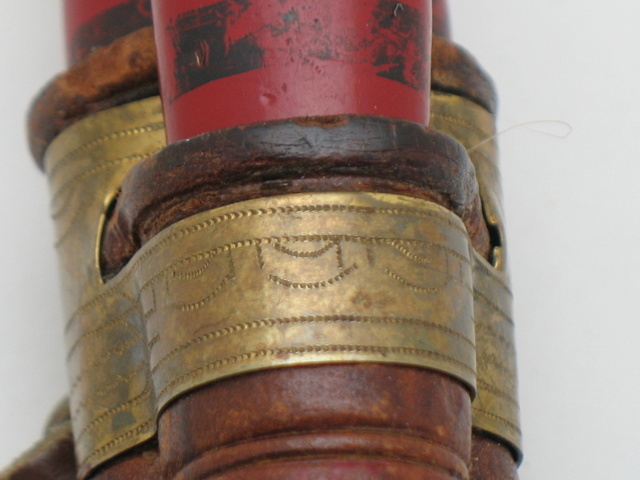 His sheaths usually have his monogram, a stylized letter M. A second feature is the blades are concave ground . His knife handles are usually painted. Igor is a student of Jon Ole Anderson and practitioner of duodji, the Sámi traditional way of life. 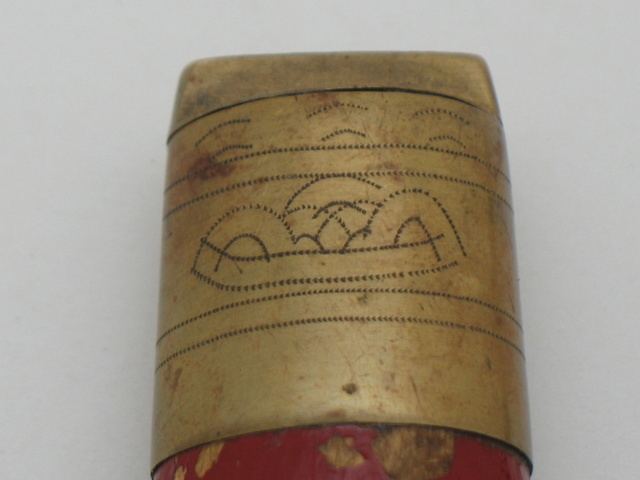 The word duodji is also used as a mark of authentic Sámi handicraft. It relates first of all to the handicraft itself and in second place to the Sámi way of life. Igor can be found on Facebook at https://www.facebook.com/profile.php?id=100002077936834 Take a look at his work! “The knife is a universal tool. The Sámi often have several knives hanging from their belts. The knives have different functions. 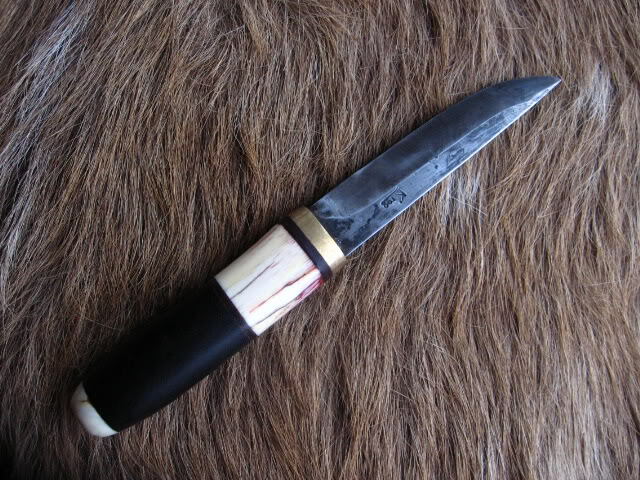 The larger knife is used instead of a hatchet, the everyday knife for all kinds of daily needs, the calf-marking knife is special and is used to cut the markings on the reindeer calves’ ears. 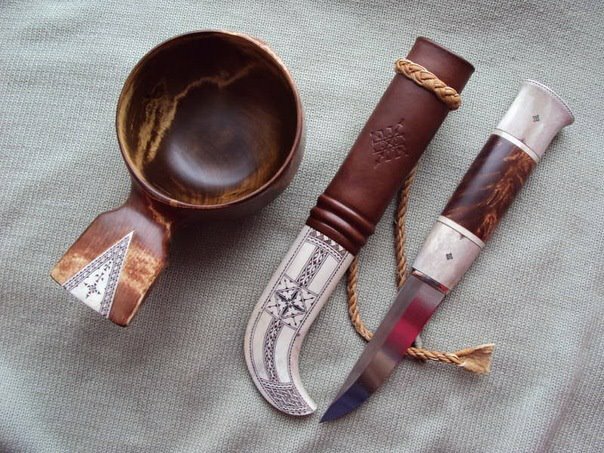 The form of the sheath of the knife depends on the natural shape of the reindeer antler and one can basically distinguish two typical shapes: one with a long gentle curve and one with a more pronounced curve. The sheath with the more pronounced curve occurs more commonly in the north. 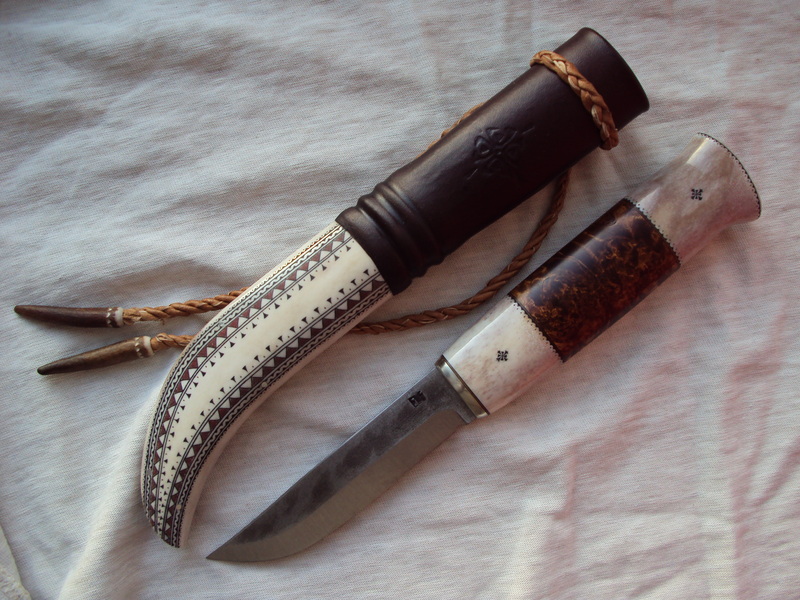 The handle of the knife is made of masur birch and reindeer antler, or totally of reindeer antler. 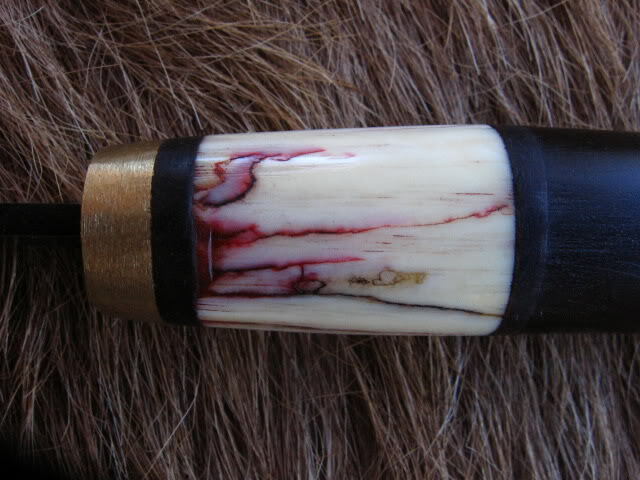 The handle often has bark between the antler pieces that gives a good hold and keeps the handle from slipping in a person’s hand. The handle ends at the top in a knob. The knob is bigger in the north Sámi area while it isn’t as pronounced in the central and south Sámi areas. 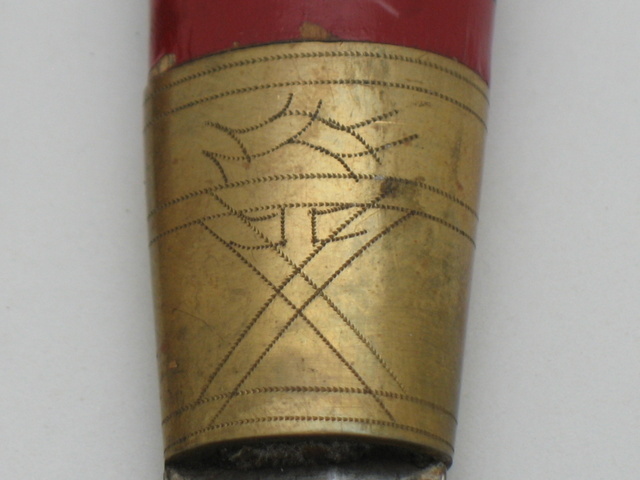 In the north Sámi areas the handle is often times not engraved while engravings in the handle are common in the central and south Sámi areas. 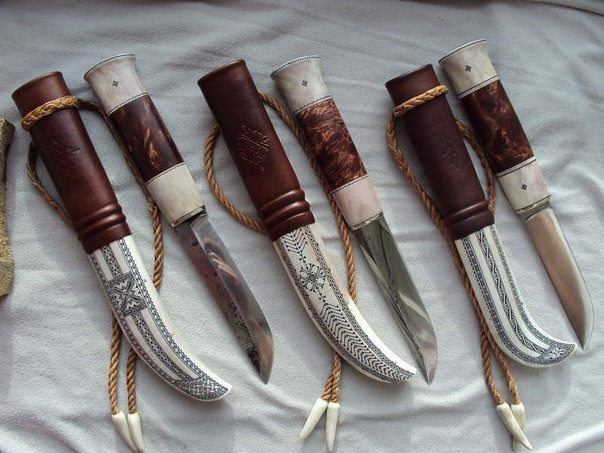 Knives are made principally in three different variations: 1) the sheath and the handle are made totally of reindeer antler; 2) the sheath is made of reindeer antler, the leather casing of rawhide and the handle of wood or reindeer antler or a combination of both antler and wood; 3) the sheath of wood and the handle of wood or reindeer antler or a combination of both antler and wood. 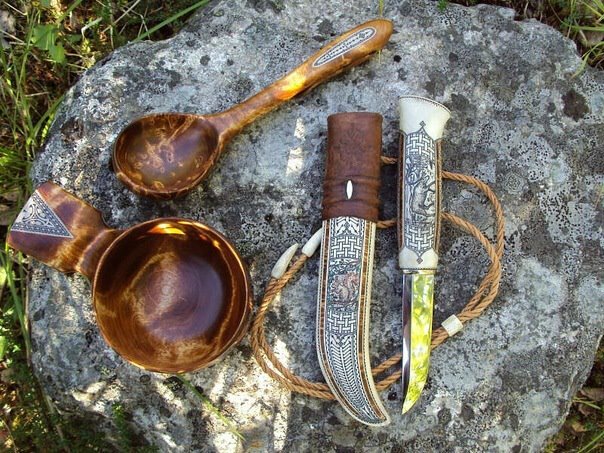 There are also other varieties of knives with the sheath of leather and knives that only have a wooden blade protection, bark or reindeer antler. 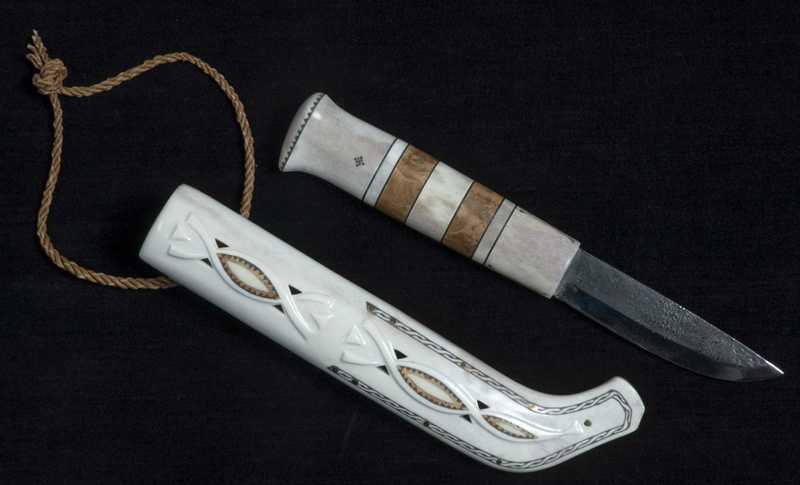 The knife with a sheath and handle totally made of reindeer antler is considered the artistic handicraft variety of Sámi knives, while the other varieties are considered everyday knives. All the sheaths have a braided reindeer cord to to hang from the belt. The north Sámi engraving is characterized by the geometric star, flower or heart motives in combination with curved lines, edging and shadings. 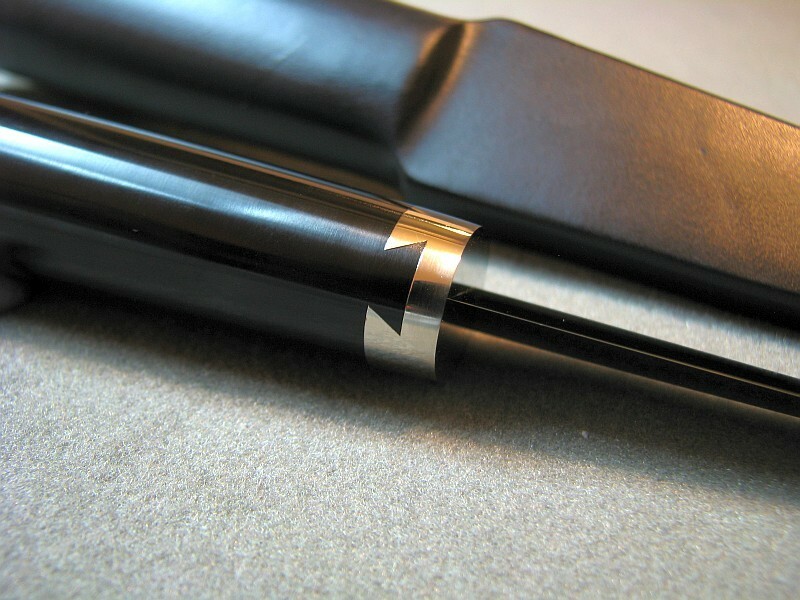 The edging consists of different engravings, sometimes a combination of different geometric cuts made with the sharp point of the knife and sometimes combined with curved lines. Especially typical is an edging that is like twined cord. I like the traditional puukko and want to show you what two talented puukkoseppa have created putting their own spin on the form. I think you will enjoy these two. “Here’s my latest puukko. It have taken over year and four months from my previous puukko (keeping busy on other business ). Take a look at his blog, the man is amazing. The Härmän puukko is a very distinctive puukko from the Ostrobothnian region of Finland. 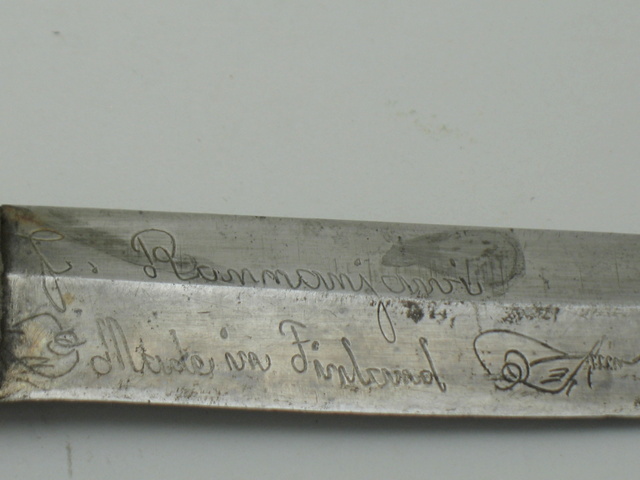 These knives have been made by the Rannanjärvi family for many years beginning with Erkki Rannanjärvi (1838 – 1925) up to Antti Rannanjärvi (b 1951) in the present day. They seem to be pretty rare and are seldom found outside of Finland other than some that were made for a shop in the U.S. some years ago. 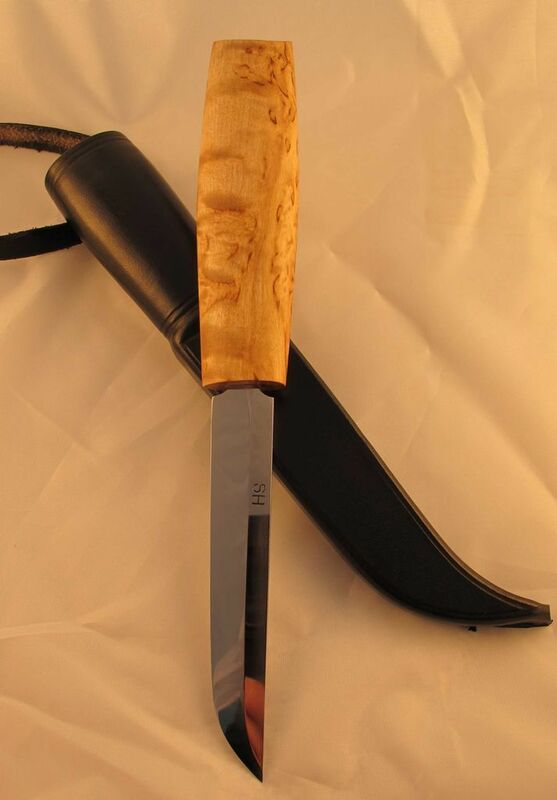 “The sheath-knife, or puukko, is an element of Finnish material culture and heritage. For the Finns it has been both an important general-purpose tool and a personal weapon. 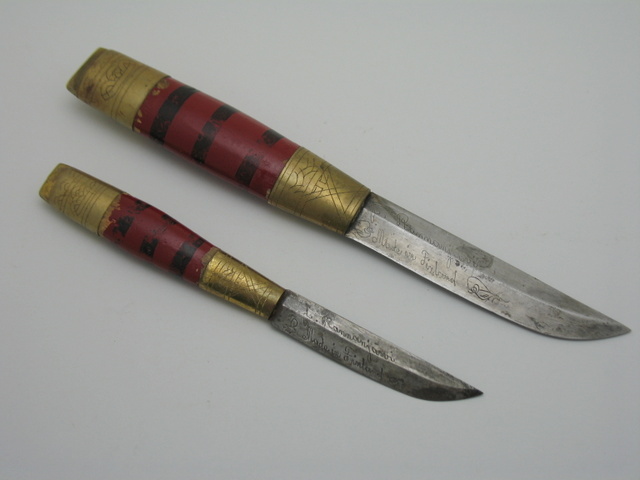 At present, the old ornamental puukko types are primarily gift items and collectibles. The knives are mostly made on an industrial basis, but a few knife-maker families have preserved the traditional crafts skills up to the present day. The Härmä puukko knife is a South Ostrobothnian type with a history extending from the mid-19th century to the 2000s. The master knife-makers of the Rannanjärvi family have made the Härmä knives by hand for four generations. The basic design has a sheath of two parts, housing a larger knife (isopuukko) and a smaller one (pikkupuukko). The Härmä knife was made in four sizes, known as Pikkupuukko (small knife), Naistenpuukko (women’s knife), Normaalipuukko (normal knife) and Anssin Jukka (named after a legendary folk hero). 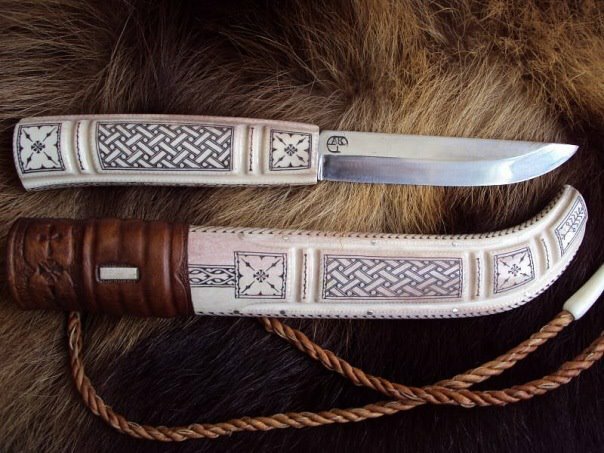 The ferruled Härmä knife was a harmonious design, in which the leather sheath and the wooden handle were richly decorated with ferrules. 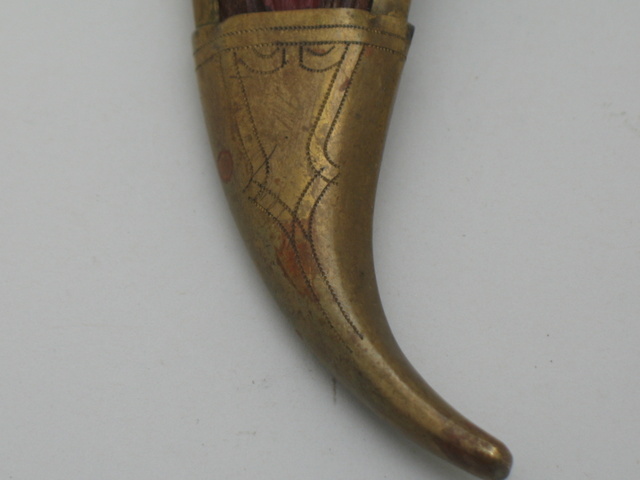 The brass ferrules bore a great number of engravings and ornamental patterns were set in the sheath. 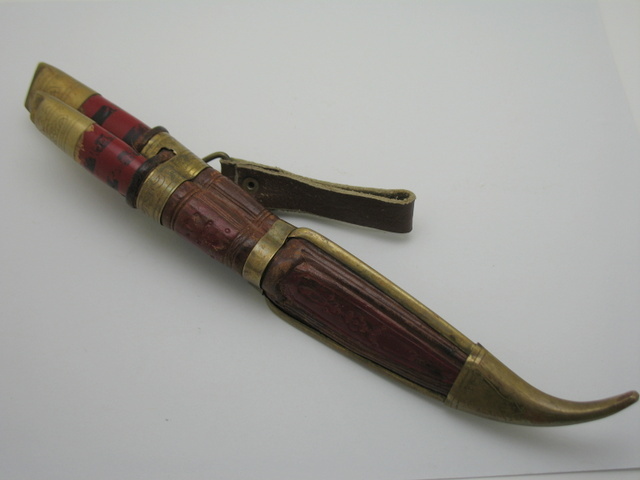 The sheath and the handles were also painted in black and red. The ornamental appearance of the Härmä knife bears witness to both a respect for the puukko knife and an appreciation of the craftsmanship of its makers.The making of the knife required a great deal of time, and special attention was paid to the quality of the workmanship. In the Rannanjärvi, family, knife-making skills were passed on as a tradition from one generation to another. Each master knife-maker of the family developed the design to some extent, while retaining the main features of the traditional methods. 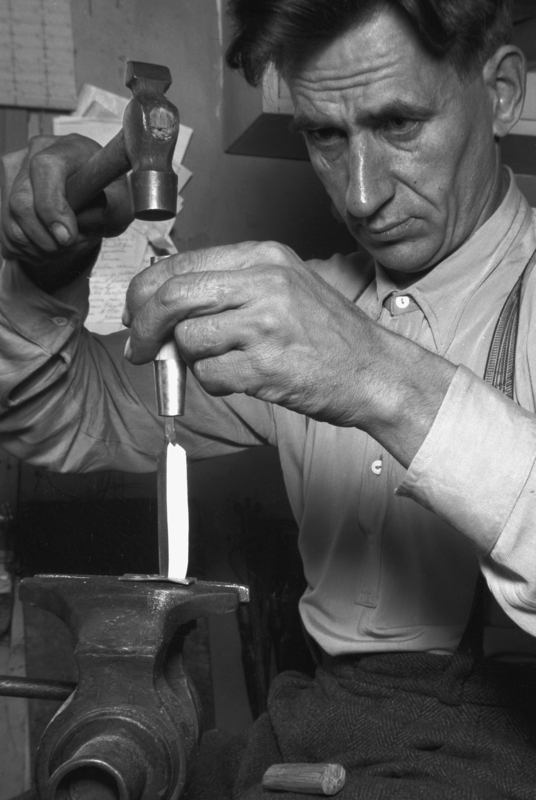 Onni Rannanjärvi (1909-1971) of Ylihärmä making a puukko knife in 1946. Photo: The National Board of Antiquities. Welcome to Nordiska Knivar my scrap book about Nordic knives. 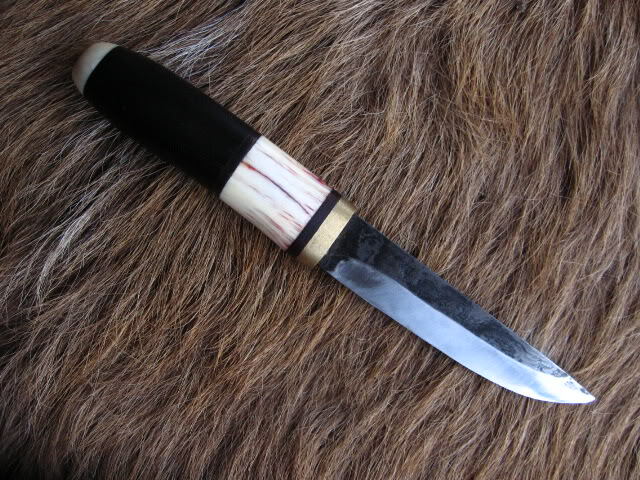 I will be posting photos and information about traditional knives and knife makers, especially the puukko from Finland. 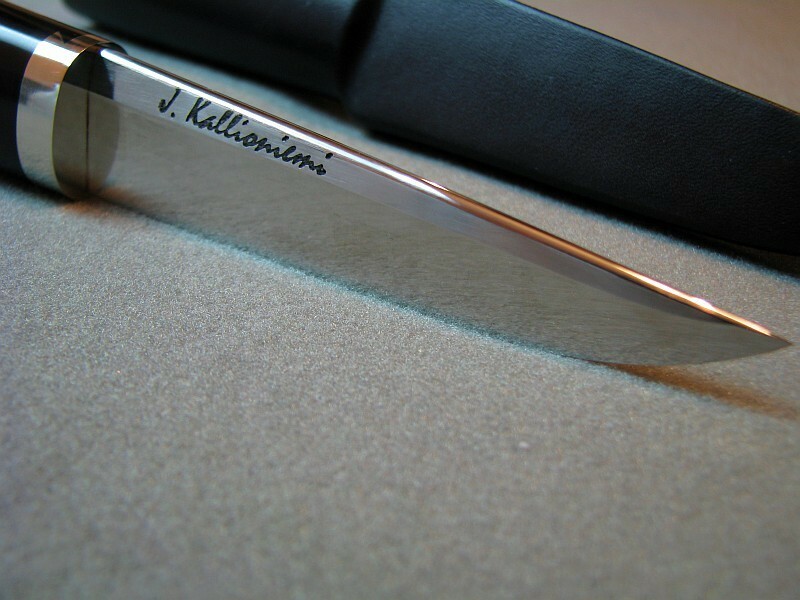 I’d like to start off with this beautiful puukko with an ebonite handle from Joonas Kallioniemi.